Objectives To find out if the presence of the metabolic syndrome increases the risk of subsequent total and cardiovascular mortality, taking into account established risk factors for cardiovascular disease. Participants A community based sample of 2322 men followed since 1970 for a maximum of 32.7 years, investigated at ages 50 and 70. Main outcome measures The relations of the metabolic syndrome defined by the national cholesterol education programme (NCEP) of the US National Heart, Lung, and Blood Institute or criteria of the World Health Organization (WHO) to subsequent total and cardiovascular mortality. Results When adding the metabolic syndrome to models with established risk factors for cardiovascular disease (smoking, diabetes, hypertension, and serum cholesterol) at age 50, presence of the metabolic syndrome as defined in the NCEP significantly predicted total and cardiovascular mortality (Cox proportional hazard ratios 1.36, 95% confidence interval 1.17 to 1.58; and 1.59, 1.29 to 1.95, respectively). The metabolic syndrome added prognostic information to that of the established risk factors for cardiovascular disease (likelihood ratio tests, P < 0.0001 for both outcomes). Similar results were obtained in a subsample without diabetes or manifest cardiovascular disease. Conclusions In a large, community based sample of middle aged men, the presence of the metabolic syndrome according to the definition of the NCEP gave long term prognostic information regarding total and cardiovascular mortality if the status of established risk factors for cardiovascular disease was known. If confirmed this may indicate clinical value in diagnosing the metabolic syndrome. The metabolic syndrome denotes a clustering of risk factors for cardiovascular disease in certain individuals. Its pathophysiology is believed to include insulin resistance1; but its definition and clinical importance are under debate.2 The metabolic syndrome has been associated with an increased risk for cardiovascular disease in a family study,3 in community based samples,4–9 and in primary preventive settings.5 10–12 In view of these observations, recent guidelines for the prevention of cardiovascular disease have encouraged identication of the metabolic syndrome in clinical practice.13 14 Previous studies have not adjusted for all established risk factors for cardiovascular disease but mostly for variables not included in the metabolic syndrome.3–5 7–12 The clinically relevant question—whether knowledge of a patient's status with regard to the metabolic syndrome adds prognostic information for an individual with known established risk factors for cardiovascular disease according to current guidelines—has therefore not yet been answered. This question is of key importance for understanding the clinical use of the metabolic syndrome.2 Furthermore, the long term risk associated with the metabolic syndrome is unknown. Our hypothesis was that presence of the metabolic syndrome increases the risk of subsequent total and cardiovascular mortality, taking into account established risk factors for cardiovascular disease. We also assumed that the prognostic impact of the metabolic syndrome may vary with age and that the predictive capacities of the National Heart, Lung, and Blood Institute's national cholesterol education programme (NCEP)13 and definitions of the syndrome from the World Health Organization (WHO)15 may differ. We therefore investigated the prognostic impact of both versions of the metabolic syndrome, at ages 50 and 70, using a large community based cohort of men followed for a maximum of 32.7 years. In 1970-3, all (2841) 50 year old men resident in Uppsala county received an invitation to a health survey aimed at identifying risk factors for cardiovascular disease. Eighty two per cent (2322/2841) of the invited men participated.16 At a re-examination of the cohort in 1991-95, at age 70, 73% (1221/1681) of invited men participated. We used both examinations as baselines in separate analyses. We fitted all models to the total samples and to “primary preventive” samples, excluding people with a myocardial infarction (9 before age 50; 144 before age 70) or a stroke (3 before age 50; 50 before age 70) before baseline or who had diabetes17 at baseline (103 at age 50; 182 at age 70). This left 2207 men in the “primary preventive” sample at age 50 and 845 at age 70. Informed consent was obtained. At the examination at age 70, in addition to the mentioned analyses, researchers determined insulin sensitivity with the euglycaemic insulin clamp technique, performed according to DeFronzo et al19 with a slight modification (insulin was infused at a constant rate of 56 mU/(min × m2)). They calculated insulin sensitivity index by dividing glucose disposal (mg glucose infused/(minute × kg body weight)) by the mean plasma insulin concentration × 100 (mU/l) during the last 60 minutes of the 2 hour clamp. The researchers used a radioimmunoassay kit (Albumin RIA 100, Pharmacia, Uppsala) to determine urinary albumin excretion rate at age 70. We used modified NCEP and WHO definitions of the metabolic syndrome (table 1).13 15 As waist circumference was measured in only 480 men in the examination at age 50, we modified the NCEP definition for use at age 50 by using a cut-off point for body mass index (BMI) instead of the given criterion of a waist circumference of more than 102 cm. In this subsample, a waist circumference of 102 cm corresponded to a BMI of 29.4 in a linear regression analysis (regression equation: BMI = 0.298 × waist circumference - 1.027). This is similar to BMI cut-offs used in previous modified NCEP definitions of the metabolic syndrome.6 BMI did not differ between this subsample (25.2 (SD 3.1)) and the rest of the cohort (25.0 (SD 3.3), P = 0.32). We denoted this definition NCEPBMI. For analyses using the age 70 baseline, we used the original NCEP definition (NCEPWAIST) and the modified NCEPBMI definition. For the WHO definition, we used two criteria for insulin resistance, in separate definitions: the lowest fourth of clamp insulin sensitivity (WHOCLAMP), and the highest fourth of homeostasis model assessment-insulin resistance (WHOHOMA). As urinary albumin and waist to hip ratio had not been assessed as part of the examination at age 50, we included the microalbuminuria and waist to hip ratio criteria only in the WHOCLAMP definition at the age 70 baseline, but not in the WHOHOMA definitions at either age, for ease of comparison. We performed two analyses with different baselines and follow-up time. In the analysis of “middle aged men,” follow-up was from the examination at age 50 (in 1970-73) to 31 December 2002, with a maximum of 32.7 years of follow-up (median 29.8 years, 60 347 person years at risk). In the analysis of “elderly men,” follow-up was from the examination at age 70 (in 1991-95) to 31 December 2002, with a maximum of 11.4 years of follow-up (median 9.1 years, 10 455 person years at risk). We used the Swedish national register recording cause of death, which includes all Swedish citizens, to define end points, so we had minimal loss to follow-up. We defined the primary end points a priori: cardiovascular death (to comply with current European guidelines,14 ICD-9 codes 390-459, ICD-10 codes I00-I99), and death from any cause. We conducted univariate analyses to assess the distributional properties of the baseline variables and used Nelson-Aalen curves to confirm proportionality of hazard. We then used Cox proportional hazard models to examine relations of baseline variables to the incidence of end-points. For each sample, baseline and end point, we examined unadjusted models (with only the metabolic syndrome variables, each in a separate model) and multivariable-adjusted models (adjusting for established risk factors for cardiovascular disease: smoking, diabetes, hypertension, and total cholesterol measurements). To test the primary hypothesis, we fitted Cox models incorporating these four established risk factors for cardiovascular disease to the total and primary preventive samples for each baseline and end point. Thereafter we added the variable of the metabolic syndrome (each definition in a separate set of models). We then used likelihood ratio tests to compare the Cox models with a metabolic syndrome variable and risk factors for cardiovascular disease with models with only the risk factors for cardiovascular disease. We defined all analyses a priori and used Stata 8.2 (StataCorp, College Station, USA, 2005) for all analyses. Baseline characteristics including prevalences of metabolic syndrome and its components in the total sample at ages 50 and 70 are presented in table 2 and table A on bmj.com. During follow-up from the examination at age 50 to 31 December 2002, 1078 men died (rate 17.9/1000 person years at risk), of which 502 died from cardiovascular disease (rate 8.3/1000 person years at risk) in the total sample. During follow-up from the examination at age 70 to 31 December 2002, 302 men died (rate 28.9/1000 person years at risk), of which 133 died from cardiovascular disease (rate 12.7/1000 person years at risk) in the total sample. 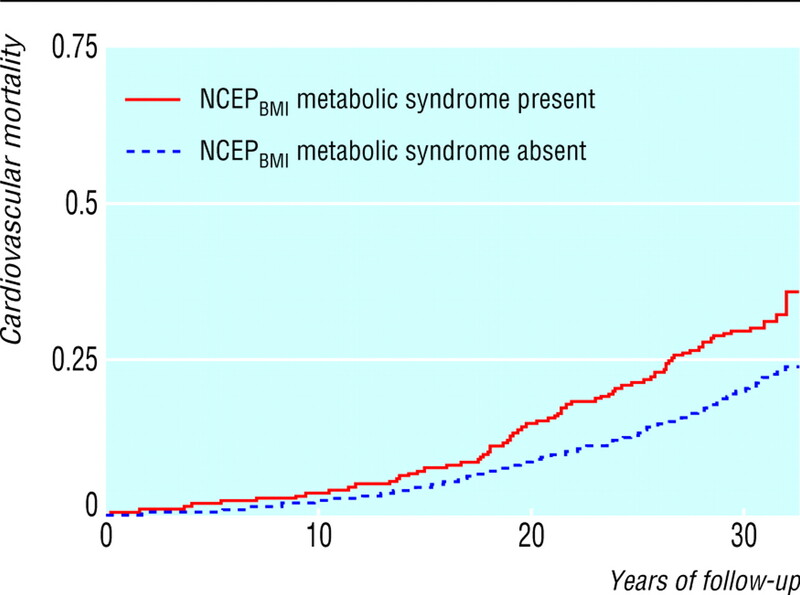 In unadjusted analyses, the presence of the metabolic syndrome according to NCEPBMI or WHOHOMA criteria at age 50 increased the risk by 1.7 times to 2.2 times for total and cardiovascular mortality in the total sample (table 3). When adding presence compared with absence of the metabolic syndrome to models with established risk factors for cardiovascular disease at age 50, both definitions of the metabolic syndrome were significant predictors of both total and cardiovascular mortality. The highest hazard ratios were associated with the NCEPBMI metabolic syndrome (risk increased by 1.4 times to 1.6 times compared with absence of the metabolic syndrome; likelihood ratio test P < 0.0001 for both end points; table 3 and figures 1 and 2), whereas the WHOHOMA metabolic syndrome was a borderline significant risk factor (likelihood ratio test P = 0.02 for both end points; table 3). We obtained similar results in the primary preventive sample; the highest risks were associated with cardiovascular mortality and with the NCEPBMI version of the syndrome. In models adjusting for established risk factors for cardiovascular disease in that sample, presence of the NCEPBMI metabolic syndrome increased the risk for total (hazard ratio 1.36, 95% confidence interval 1.16 to 1.60; likelihood ratio test P = 0.0003) and cardiovascular mortality (1.55, 1.24 to 1.93; P = 0.0002). Presence of the WHOHOMA metabolic syndrome was a borderline significant risk factor also in the primary preventive sample (1.22, 1.00 to 1.49; P = 0.06 for total mortality; and 1.24, 0.95 to 1.62; P = 0.12 for cardiovascular mortality). In unadjusted analyses, the presence of the metabolic syndrome according to NCEP or WHO criteria at age 70 increased the risk by 1.5 times to 2.3 times for total and cardiovascular mortality in the total sample (table 3). In this age group, some of the versions of the metabolic syndrome were borderline significant risk factors when we had adjusted for established risk factors for cardiovascular disease (likelihood ratio test P > 0.01 for all; table 3). The highest hazard ratios were associated with cardiovascular mortality and with the WHOHOMA version of the syndrome. In the primary preventive sample, none of the versions of the metabolic syndrome was a significant predictor of total or cardiovascular mortality in unadjusted models (P > 0.10 for all) or models with established risk factors for cardiovascular disease (P > 0.37 for all) at age 70. In a community based cohort of men with long follow-up, the metabolic syndrome (according to the NCEP definition) was an independent risk factor in middle age for total and cardiovascular mortality, when established risk factors for cardiovascular disease were taken into account. The metabolic syndrome did not consistently predict adverse outcomes in elderly men. Our observations confirm findings of previous studies3–12 and expand knowledge of the clinical utility of the metabolic syndrome as we adjusted for more established risk factors for cardiovascular disease than most previous studies, in which the general approach was to adjust only for variables not included in the metabolic syndrome, such as low density lipoprotein cholesterol and smoking.3–5 7–12 We also investigated the long term prognostic significance of the metabolic syndrome. Our study had considerably longer follow-up time than previous studies.3–12 This may be important, as an apparent lag time of 10-15 years occurred before the mortality curves for men with and without the NCEPBMI metabolic syndrome started to diverge in our study (figures 1 and 2). Consequently, because all previous studies had less than 15 years of follow-up, they may have underestimated the overall mortality risk associated with the metabolic syndrome. 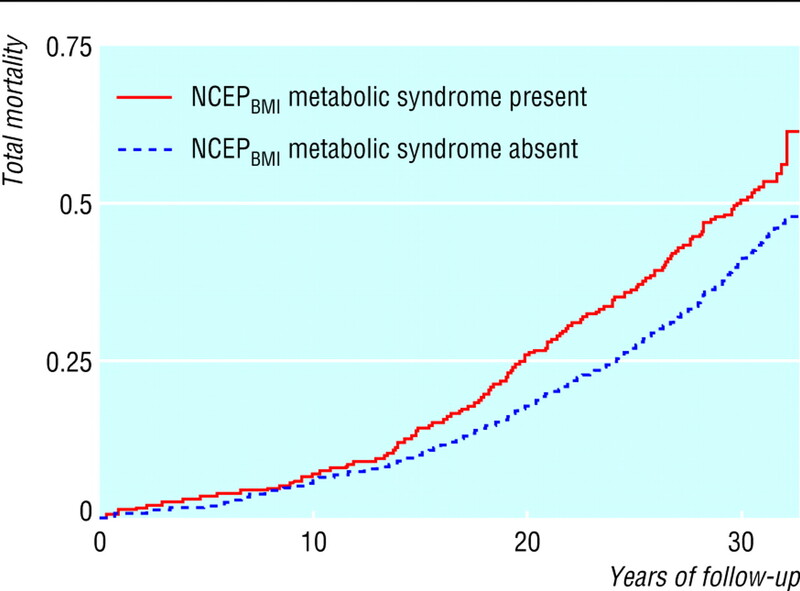 In accordance with some previous studies,5 10 we investigated a primary preventive sample, and in contrast to the resultsof one previous study,5 in ourstudy the NCEP metabolic syndrome seemed equally predictive in primary prevention as in the general population in middle age. The metabolic syndrome added little prognostic information at age 70 in either sample. This may be a result of a smaller sample size at age 70, as the point estimates for the metabolic syndrome are similar at age 50 and 70, but the confidence intervals were wider at age 70. A healthy cohort effect, shorter follow-up, and competing non-cardiovascular causes of death may also account for the lower prognostic impact at age 70. The mean age of previously studied samples was about 50 years,3–12 20 21 and our observations need to be confirmed in other elderly samples. The NCEP definition seemed to predict mortality slightlymore strongly than the WHO definition in middle aged men in our study. Similar results were obtained in some,5 but not all, previous studies.10 Reasons for this may include the lower blood pressure threshold, the higher threshold for high density lipoprotein cholesterol, and the dual dyslipidemia criteria in the NCEP definition (rendering the NCEP definition more weighted towards people with suboptimal blood pressure and dyslipidemia), and the absence of a compulsory glucose dysregulation criterion in the NCEP definition (glucose dysregulation may be characteristic for the metabolic syndrome in obese or diabetic samples, but may in leaner or elderly samples be relatively more reflective of incipient β cell dysfunction). At age 70, the WHOHOMA version seemed slightly more predictive than the WHOCLAMP version, which could be regarded as the most accurate WHO version possible. One possible explanation is that this is a chance finding, as the 95% confidence intervals are largely overlapping. Another is that hyperinsulinaemia (reflected in the WHOHOMA version) may be viewed as an integrated measure of insulin resistance and hyperproinsulinaemia (which is not identified by the WHOCLAMP version), which both predict coronary events.22 A third explanation is that the low threshold for the waist to hip ratio used in the WHOCLAMP definition may identify many individuals at low risk. Some limitations of the study are worth mentioning. The modified definitions of the metabolic syndrome led us to refrain from formal statistical comparisons of predictive capacity between the definitions. At the age of 50, a measurement of microalbuminuria was not available for the original WHO definition. Previous studies comparing the WHO and NCEP definitions have also omitted microalbuminuria from the WHO definition,5 10 since it has been proposed that this risk factor is not associated with insulin resistance or other components of the metabolic syndrome.23 We further had to substitute body mass index for abdominal obesity in the NCEP definition at age 50, and did not account for waist to hip ratio in the WHO definition at age 50. It should be noted, however, that at age 70, the WHOHOMA definition (lacking microalbuminuria and waist to hip ratio) was more predictive than the complete WHOCLAMP definition, and the NCEPBMI definition performed equally as well as or better than the original NCEPWAIST definition. Other limitations include the homogenous sample of men of the same age and ethnic background, so that this study has unknown generalisability to women or other age groups and ethnic groups. In addition to the long follow-up period, strengths of this study include the large population, the availability of two baseline investigations 20 years apart, the minimal loss to follow-up, the reliable endpoint definitions, and the detailed metabolic characterisation of the cohort, including the euglycaemic insulin clamp, which is the gold standard method for assessment of insulin sensitivity. Showing that the metabolic syndrome has an independent predictive value of the metabolic syndrome above and beyond that attributable to established risk factors for cardiovascular disease is quite a challenge, as some of these conditions are included in the metabolic syndrome definitions. We nevertheless chose this approach in order to mimic the clinical risk evaluation situation, in which the status of the established risk factors for cardiovascular disease is deemed to be known.13 14 Consequently, we used robust statistical methods that can handle some collinearity. The assumption that clinical decision making adheres to current guidelines13 14 led us to model the established risk factors for cardiovascular disease mainly as dichotomous variables. In this large community based sample of middle aged men, the presence of the metabolic syndrome according to the NCEPdefinition gave long term prognostic information regarding total and cardiovascular mortality if status of established risk factors for cardiovascular disease was known. Additional similar studies are needed to confirm the value of defining the NCEP metabolic syndrome in clinical practice. It may therefore be meaningful to diagnose the syndrome for risk prediction in primary care. Hans Lithell died on Nov 27, 2005. Contributors JS, UR, LB conceived and designed the study. JS performed planning and analysis. JS drafted the paper. JS, UR, LB, BZ, HL, and LL interpreted the data and revised the paper. JS is guarantor. Funding Thuréus Foundation, the Swedish Heart-Lung Foundation, and the Swedish Society for Medical Research. The funding sources had no involvement in the research. Ethical approval Uppsala University Ethics Committee.
. Banting lecture 1988. Role of insulin resistance in human disease. Diabetes 1988;37: 1595–607.
. The metabolic syndrome: time for a critical appraisal: joint statement from the American Diabetes Association and the European Association for the Study of Diabetes. Diabetes Care 2005;28: 2289–304.
. Cardiovascular morbidity and mortality associated with the metabolic syndrome. Diabetes Care 2001;24: 683–9.
. Impact of the metabolic syndrome on mortality from coronary heart disease, cardiovascular disease, and all causes in United States adults. Circulation 2004;110: 1245–50.
. National cholesterol education program versus World Health Organization metabolic syndrome in relation to allcause and cardiovascular mortality in the San Antonio heart study. Circulation 2004;110: 1251–7.
. Metabolic syndrome with and without c-reactive protein as a predictor of coronary heart disease and diabetes in the West of Scotland coronary prevention study. Circulation 2003;108: 414–9.
. C-Reactive protein, the metabolic syndrome, and prediction of cardiovascular events in the Framingham offspring study. Circulation 2004;110: 380–5.
. The metabolic syndrome and mortality from cardiovascular disease and all-causes: findings from the national health and nutrition examination survey ii mortality study. Atherosclerosis 2004;173: 309–14.
. Prevalence of the metabolic syndrome and its relation to all-cause and cardiovascular mortality in nondiabetic European men and women. Arch Intern Med 2004;164: 1066–76.
. The metabolic syndrome and total and cardiovascular disease mortality in middle-aged men. JAMA 2002;288: 2709–16.
. Cardiorespiratory fitness attenuates the effects of the metabolic syndrome on all-cause and cardiovascular disease mortality in men. Arch Inter Med 2004;164: 1092–7.
. C-Reactive protein, the metabolic syndrome, and risk of incident cardiovascular events: an 8-year follow-up of 14 719 initially healthy American women. Circulation 2003;107: 391–7.
. Final report. Circulation 2002;106: 3143–421.
. European guidelines on cardiovascular disease prevention in clinical practice. Third Joint Task Force of European and Other Societies on Cardiovascular Disease Prevention in Clinical Practice. Eur Heart J 2003;24: 1601–10.
. Definition, diagnosis and classification of diabetes mellitus and its complications: report of a WHO consultation. Geneva, WHO, 1999. Part 1: Diagnosis and classification of diabetes mellitus.
. A study of middle-aged men with particular reference to risk factors for cardiovascular disease. Ups J Med Sci Suppl 1975;19: 1–61.
. Diabetes Care 1997;20 (suppl 1): S1–70.
. Homeostasis model assessment: insulin resistance and beta-cell function from fasting plasma glucose and insulin concentrations in man. Diabetologia 1985;28: 412–9.
. Glucose clamp technique: a method for quantifying insulin secretion and resistance. Am J Physiol 1979;237: E214–E223.
. The metabolic syndrome and risk of major coronary events in the Scandinavian simvastatin survival study (4S) and the air force/Texas coronary atherosclerosis prevention study (AFCAPS/TexCAPS)*1. Am J Cardiol 2004;93: 136–41.
. Prognostic value of the metabolic syndrome in essential hypertension. J Am Coll Cardiol 2004;43: 1817–22.
. Insulin sensitivity, proinsulin and insulin as predictors of coronary heart disease. A population-based 10-year, follow-up study in 70-year old men using the euglycaemic insulin clamp. Diabetologia 2005;48: 862–7.
. Comment on the provisional report from the WHO consultation. European Group for the Study of Insulin Resistance (EGIR). Diabet Med 1999;16: 442–3.